This Pink Dog Shirt is trimmed in matching lilac and has a pretty flower embroidery on the back. 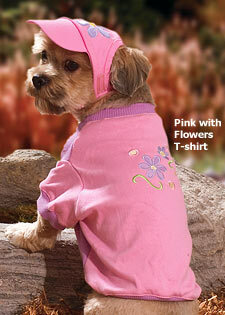 The Pink Dog Shirt is made by Doggles Manufacturing and is a comfortable and classy outfit for your dog. Features gentle ribbed cuffs and waistband. Please note the image is for illustration purposes only. The cap does not come with the shirt.